The farmers have been protesting for the past two months demanding the establishment of a National Turmeric Board and setting a Minimum Support Price for turmeric. As one approaches the Nizamabad Collector’s office, heavy police presence is visible in the area surrounding it. The Collector’s office is busy with activity with candidates filing their nominations for the upcoming Lok Sabha elections. A tent has been erected under which hundreds of agitating turmeric farmers from the region are busy chalking out their next plan of action. 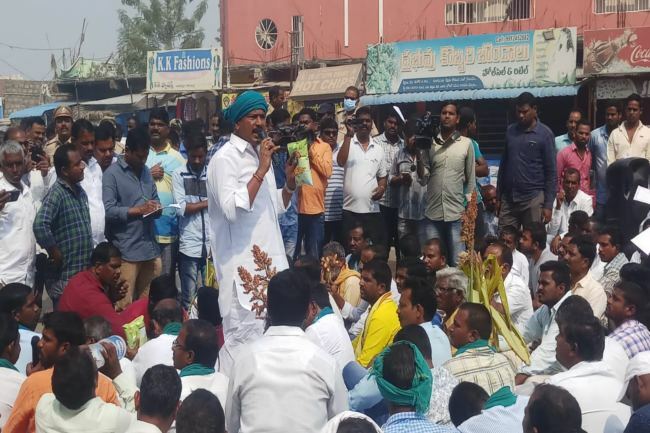 For the past two months, these farmers have been protesting for their long-standing demand for the establishment of a National Turmeric Board to weed out the middlemen and setting a Minimum Support Price for turmeric and red jowar (sorghum). The demand for establishing a turmeric board for ensuring stable prices was backed by the sitting Nizamabad MP, Kalvakuntla Kavitha, during her poll campaign in 2014. “Turmeric farmers are suffering due to lack of (proper) prices and other facilities. I will ensure that a turmeric board is set up in Nizamabad for their betterment,” Kavitha had said in 2014, during one of her campaigns. In this regard, Kavitha also moved a Private Member’s Bill in the Parliament – the Turmeric Board Bill – in 2017 after being elected as the Nizamabad MP. In the Bill, she said that the board should have a chairperson, MPs, government representatives from nodal ministries, representatives of turmeric farmers, exporters and scientists. However, as the board was not established under her tenure, the farmers are resorting to a unique protest to highlight their grievances. The farmers have formed a union and have filed nominations to contest in the Lok Sabha elections. “We were left with no other option. They (government) have curtailed all our freedom; we are not allowed to conduct rallies or protest on roads. Hence, we took up this decision to register our protest,” says, Anvesh Reddy, a farmer activist who is leading the struggle. 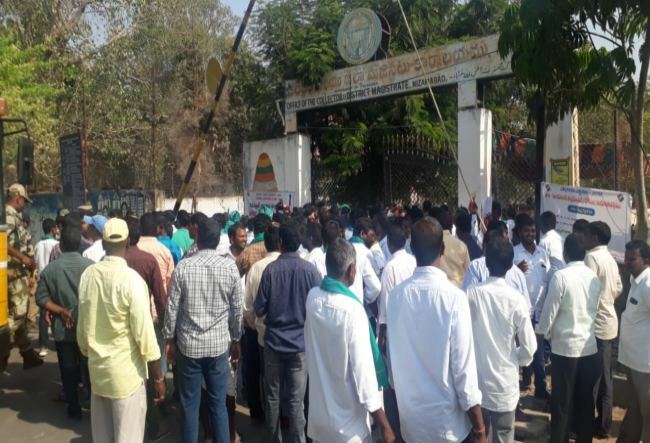 Farmers from the constituencies of Bodhan, Balkonda, Nizamabad rural, Nizamabad urban, Korutla, Armoor and Jagtial, which fall under the Parliamentary constituency of Nizamabad, have filed at least 250 nominations. Due to the overwhelming number of candidates in the fray, the Election Commission has scrapped EVMs and will be using the traditional ballot papers. Before filing the nominations, the farmers had planned a huge rally from Nizamabad to Hyderabad. However, the police denied them permission and also imposed section 144 (prohibition of gathering of five or more people, holding public meetings). The agitating farmers have been slapped with several cases for defying the order of the police. 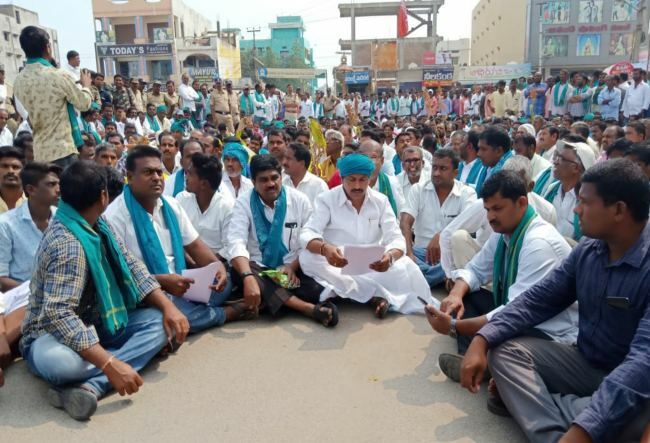 While Kavitha dismissed the protest as a conspiracy by the BJP and the Congress to ruin her chances of being re-elected, the farmers claim that they do not have a political agenda or the backing of any political party. “Each farmer is affiliated to one party or another. Villages are very political… it is extremely difficult to point out a farmer who doesn’t have any political affiliation. However, denouncing their political affiliations, people have joined the protest as farmers. This is a struggle of farmers, and we will welcome any party which raises our concerns,” Anvesh says. 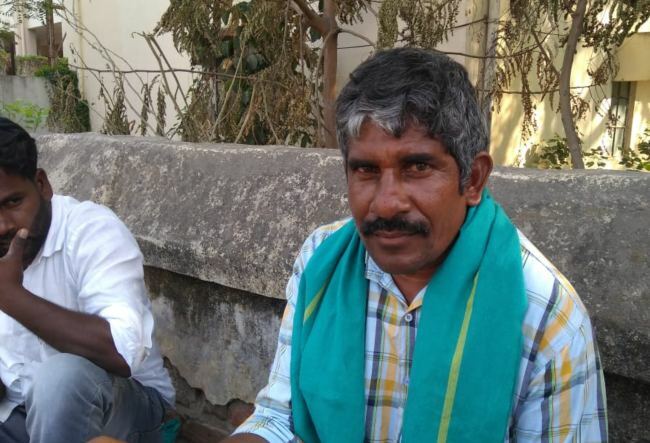 After the farmers decided to file nominations, the TRS party allegedly asked the farmers to withdraw the plan and tried convincing them that they were unable to make any promises as the Model Code of Conduct was in place. “They are assuring bonus through the local leaders, but we don’t need such petty compensation. We require a permanent solution to this problem,” Anvesh claims. The primary crop in Nizamabad district is turmeric. According to the Directorate of Economic and Statistics report of 2012-13, 5,668 hectares of turmeric were cultivated in Nizamabad, the highest production of the plant after Karimnagar, Ranga Reddy, Adilabad, Mahabubnagar and Nalgonda districts. The region is categorised as Northern Zone (region which receives the highest rainfall), which also includes Adilabad and Karimnagar. The annual rainfall in the region ranges between 900 mm to 1,150 mm. The turmeric produced in Nizamabad is exported to countries such as Pakistan, Bangladesh, Sri Lanka among others. In 2016-17, Telangana produced 3,05,097 tonnes of turmeric, and a majority of it was produced in Nizamabad. Farmers in this region have traditionally been growing turmeric and refuse to switch to other crops claiming that the yield is excellent in the region due to favourable soil and climatic conditions. Growing turmeric requires a lot of investment. For growing one acre of turmeric, which yields about 35 quintals of produce, provided there is good rainfall, a farmer has to spend between Rs 1,30,000- Rs 1,50,000. Farmers claim that they are not able to get back their investment. “While we are spending Rs 7,000 for one quintal, the government is promising only Rs 4,500. How is it feasible?” asks farmer Suryam Shivaraj. The BJP-led Centre had introduced the eNam (electronic National Agriculture Market) platform in April 2016 and interlinked all the mandis (market yards) on a single platform so that farmers have access to a larger market and get better prices in a transparent bidding mechanism. eNam allows farmers to sell their goods to the highest bidder from across the country. Soon after the platform was introduced, the Nizamabad market was quick to adopt it to weed out the middlemen. Though eNam is not completely implemented in the Nizamabad market, the bidding is taking place through the platform since 2017. As per the eNam process, the goods are brought to the market yard and stored in a shed, and the lot number is given to the farmer. A licensed local trader then takes over and act as the interlocutor. Samples of the turmeric brought by the farmer are graded after testing them in a laboratory. Staff trained by National Collateral Management Services check the moisture levels in the turmeric, besides other factors, and determine the quality. Based on the quality, the local trader fixes a price and interested purchasers then quote their price. The eNam software automatically gives the tender to the bidder who quotes the highest price. The mechanism to bring transparency has, however, failed, allege farmers. “Earlier, when the goods are brought to the market, the bidders would be physically present; they would check the quality and then compete to buy the goods through auctioning. This ensured that the highest bidder, whoever offered more money, got the product. But after the introduction of eNam, that process has been eliminated. Now the middlemen are determining a uniform price for all farmers, which is ridiculous,” says Anvesh. Not just Anvesh, several others share the same sentiment. However, the authorities dismiss the allegations and say that the farmers have ‘misunderstood’ the process. “It is a lack of understanding on their part. eNam is fully transparent. Only if there is a demand would the local traders be able to sell the produce for a high price. Since they are not getting a good price due to the falling demand, they are under the assumption that they’re being cheated by the traders,” says Nizamabad Agriculture Market Committee secretary Swaroopa Rani. In Nizamabad, the crop is grown only by the land-owning rich farmers belonging to the upper castes due to the heavy investment it requires. Turmeric is a 10-month crop. Harvesting it involves a lot of labour. Once the crop matures, the leaves turn yellow, following which the farmers cut the leaves off. Then they plough the land and the rhizomes (root stalk) are either pulled out manually or with the help of a spade. “We require 60 labourers during harvest time – 50 female and 10 male labourers. For men, the wage per day is Rs 1,000 and for women the wage is Rs 300. We spend close to Rs 25,000 on labour itself,” says Manohar Reddy, a farmer. Ploughing for turmeric requires hiring bulls. “Tractors are unsuitable for turmeric cultivation. So we have to hire bulls and plough manually. The cost of hiring bulls is Rs 4,000 per day per acre,” says Manohar. The farmers claim that though they have been engaged in turmeric cultivation for decades, they made heavy profits only once. “It happened only in 2014, when there was a heavy demand for turmeric. The price was at Rs 14,000 per quintal, the highest so far. Today, the market price is Rs 4,500 per quintal. This fluctuation is unacceptable,” Anvesh says. Disappointed with the market price in Telangana, farmers are selling the produce in the neighbouring state of Maharashtra. According to farmers, there is a price difference of Rs 1,000 to Rs 1,500 per quintal between Telangana and Maharashtra. “While the market rate for turmeric in Telangana is Rs 4,500, the same produce can be sold for Rs 5,500 per quintal in Sangli (a popular turmeric market in Maharashtra). Though farmers are incurring transport costs, they are prepared to sell their produce there,” says Manohar.